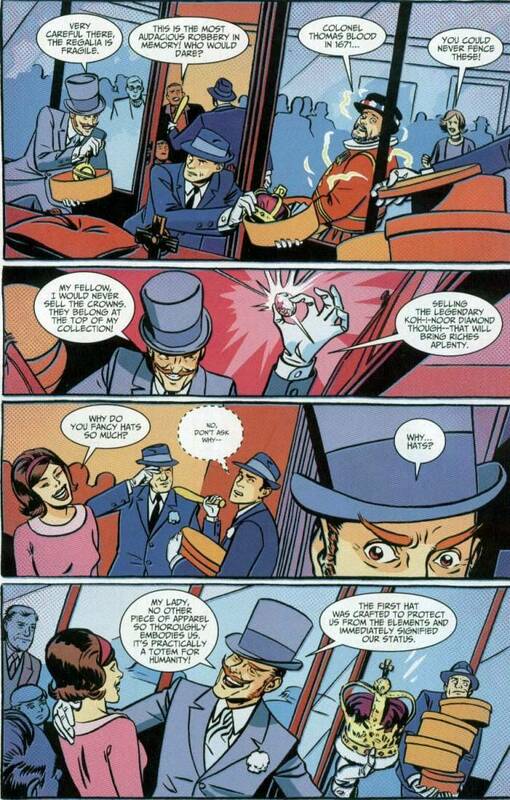 scans_daily | Villains Being Awesome - The Mad Hatter takes a question from the audience..
Paul Cornell's British heroes from Knight and Squire would fit so well with Batman '66. I could see a pre-Bond Roger Moore would be a good model for the Knight. Not really a fan of the British Bat-mobile. Not that there's anything wrong with it other than not looking like a Bat-mobile. I'd understand if they were going undercover, but they're pretty much announcing to the world that they're in London. 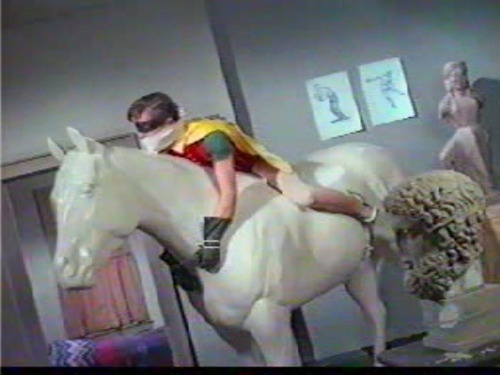 Of course, I didn't remember Robin being bound and gagged by the Mad Hatter in the TV series, but of course I wasn't looking for it either. It's not the design classic the American Batmobile is, that's for sure, it's more of a shout out to the Golden Age in many ways. For me, part of what made the 1966 series great was the Bat-mobile. It was something truly different, and to this day it's still special for any number of people. 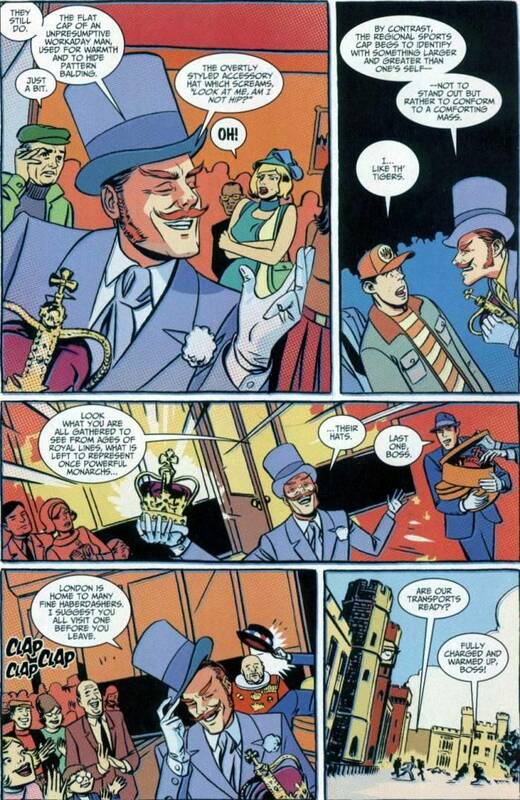 I agree that this version does harken back to the 1940's version, but I can't say it's better. 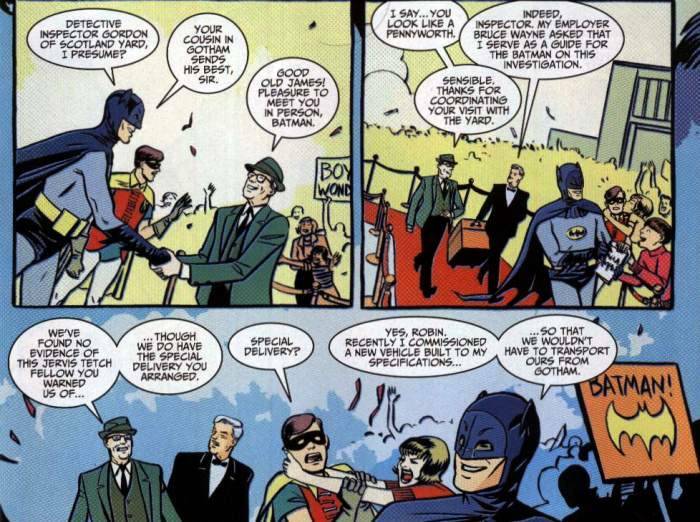 Was Bats ever referred to as "THE Batman" in the TV show? From what I remember Batman was always used there as a proper noun rather than as a title. I believe he was, though not to his face. 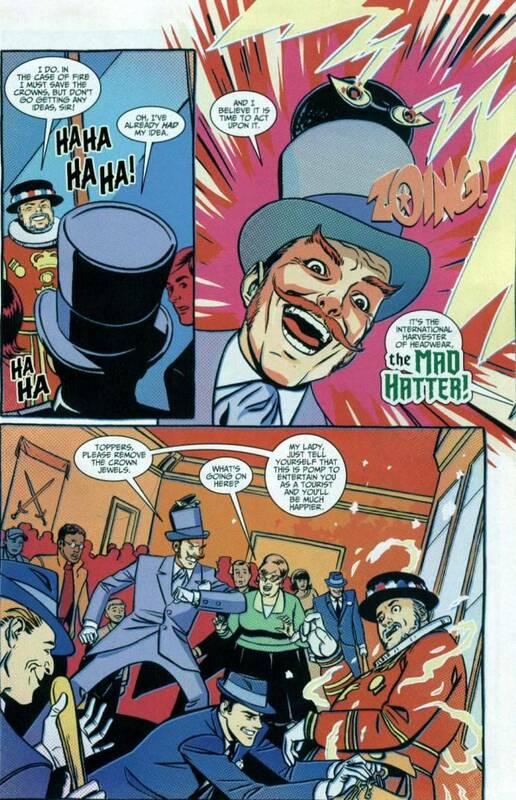 I'm moderately sure that O;Hara and Gordon would sometimes refer to having to call on the services of "The Batman"
According to certain sources on the Internet, David Wayne actually hated his role on the show - I think he even claimed that Dozier and company "blackmailed" him into doing the second Hatter storyline. Don't know how much of it is true, though. On a lighter note: holy cow this looks fun. I might have to pick it up myself (sadly, it appears that Batgirl is absent). A shame if it's true about the blackmail, though it wouldn't surprise me. They certainly treated Burt Ward badly, though I dont know how true the stories of the conflict between him and Adam West were. Odd... I would have sworn they visited England, or at least some part of Europe, in the show itself. 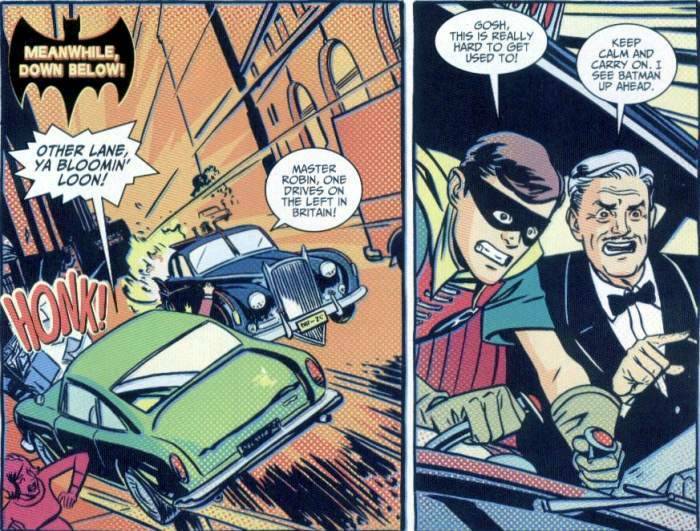 I bring it up because I seem to vividly remember Batman instructing Robin to remember to drive on the left, as only Adam West could. As I sort of mention in the OP, they did, and yet they didn't. I think they're just trying to keep with the fictional cities tradition. If America has a Gotham instead of a New York, then England has a Londinium! ...ah, that would explain that part. And, IIRC, New Jersey became "New Guernsey". Correct, it's where one of Catwoman's lairs was. Given that a guernsey is a much less well known form of knitwear than a jersey is (despite sharing the reason for their names), I have to admire their Channel Islands research on that one. They are also both types of cows. Perhaps that's what they were going for. Not really necessary as an explanation. The "New" bit indicates it's a geographical reference. Guernsey and Jersey are two of the Channel Islands and are adjacent to each other. As a half-Brit who has made multiple trips to the UK all my life, I'm aware of the geography. I was merely remarking what I thought the *writers of the show* might have used as their inspiration rather than an article of clothing basically unknown in the States. I'm happy to be convinced otherwise, but I don't need a map or someone informing me of what is a fairly obvious (the cows are named for their place of origin?!) but moot point. In the past I have had to explain where Jersey was, and what a Guernsey even was, so thought a map might be more interesting. Re-reading it after several hours sleep it does seem rather school-marmish, sorry about that. I appreciate it, and hope I in turn did not come off as too aggravated over a minor matter. I've always loved your often witty posts and your calm, amenable Internet manner, so coming from you it seemed to me a bit more aggressive than it might have from anyone else. Ah, that would explain that... but still doesn't really explain Robin's inexperience with driving on the left side of the road. Any idea why they made up all those places? It's all what you're used to. I've been to England numerous times, but I still have to remind myself each time that things are reversed. Meanwhile, I actually know someone who got in an accident because an English driver who'd been living in the States for years forgot one day and drove down the wrong side of the road.